3rd grade of Mihama academy, the Onee-san type who always takes care of others. 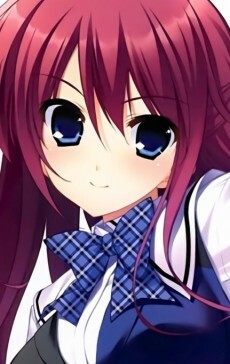 For some circumstances, she skipped one school year at her previous school, so she is actually 2 years older than Yuuji. She is tall and has good body style. Her family manages a long-established restaurant in Ginza, so she is good at cooking. Because her mother comes from Kyoto, when getting excited or panic, she sometimes talks in Kansai dialect. She has a deep interest in car and has acquired automatic two-wheeled vehicle license. She has a dirt bike which was remodeled to a cruiser called “Boba Tarou” and is put in the garage of the academy. Her representative fruit is cherry.